We recently published a post on the Johnny Cash Trail Grand Opening and Ceremony and now that the dust has settled, we went in for some amazing shots. It is with great pleasure, we get to cover the Johnny Cash Bridge and Trail again. With stunning ground photography and aerial photography by local photographer; Anthony Occhipinti and edited by Brenan Greene, there is much to learn about this bridge and trail. The Johnny Cash Trail in Folsom is not only a symbol of California history but now a state-wide attraction. Thanks to city of Folsom, the Folsom Chamber and the support of many local Folsom residents, the project is now closer to being complete. The Johnny Cash Trail will eventually connect to the trail along Lake Natoma, and will have other branches going to the Folsom Prison and elsewhere on the prison grounds. 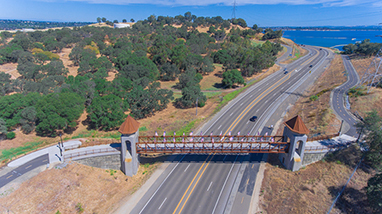 The trail; a 2.5-mile line between Folsom Lake and downtown Folsom district, is now one of the most iconic symbols in the Greater Sacramento area. This has been a project that’s been in the works since October 2010 in which Folsom has now completed, allowing local pedestrians and bicyclists the chance to walk the line.